This is it. Things will move fast now. Our next trip to Philadelphia will be an extended stay for the birth of our son. We learned a lot of new information today that will help prepare us for that trip. August 22nd is the date of Brandi's next appointment. Hard to imagine we will not be coming home after that appointment as they will start monitoring Brandi weekly. Time will stop for us until we know the outcome of the events to come. It is very likely that we will miss Caleb's birthday, Thanksgiving, Christmas and even usher in the new year in Philadelphia. The sonogram today went very well. Jordan is exactly the weight he should be for this stage of pregnancy. His lung-to-head ratio is 1.4, which means that his lung volume has increased as he has gotten bigger. The observed to expected lung area was better this time around too: .5 this time as compared to .3 last time. This ratio compares Jordan's lung development with normal development of a fetus without CDH. We were concerned that they could not locate the left-lung again (they had trouble locating this lung last time). They explained that the left-lung is being pushed up into the atrium of the left side of the chest - meaning that it's so high up the bones of the shoulder and chest block it from being detected on the sonogram. This is not uncommon for a fetus with CDH. Our doctor today said that their success rate at CHOP for children with CDH is around 90%. Unfortunately, for children with the liver "up", that succes rate drops to around 40-50%. Jordan's liver is "up". The liver is a solid mass of tissue as compared to the intestines, which are soft, flexible tissue. CDH is dangerous because the lungs are restricted by the organs around them. The liver "up" is not a good indicator. We greatly enjoyed the company of our financial advisors. They lightened the atmosphere as they worked hard to find a way to help us financially. We are excited to say that it appears we will qualify for Charity Care. Basically, the hospital will put a limit on our out-of-pocket medical expenses of around $1,700. Plus, they were able to include both Jordan and Brandi in this plan - one limit for both of them. They are planning to finalize our enrollment at our next appointment. Our other main expenses will be travel and the typical expenses being away from home. We greatly appreciate everyone who has supported our family, both in prayer and finances. We are looking forward to the garage sale this Friday. Housing is one of the major pieces not determined. The Ronald McDonald house is completely booked up. They may have an opening for us in August; they may not. We are going to look into getting on a waiting list for a host family (families who have dedicated a place to stay for other families who are facing medical hardship). Given the circumstances, we feel that things are going as well as they can. Families facing hardship have to make decisions and face trials that aren't easy. One of the toughest obstacles in our minds is facing so much time away from Caleb. We are a close family and the thought of leaving him behind is difficult. We know that we don't have a choice. Our time and focus needs to be on the pregnancy and Jordan. It will be well worth it if we get to bring a little brother home. We, including Caleb, pray for Jordan everday. For those who desire to pray for Jordan, we are praying that his lungs will continue to grow and that he will be ready to fight. We are praying for the medical team as they will be providing special treatment in those first precious moments, months and years of his life. We believe God has our son in His hands regardless of the outcome. All things considered, we want to bring our son home more than anything in the world. We will share more on this later as we discuss a book that has helped us prepare for Jordan's birth. We head out to Philadelphia tomorrow for our follow-up appointment. Not exactly a trip downtown to see our doctor. Our flight will leave Sunday afternoon from Kansas City. CHOP has scheduled appointments for us all day Monday. Brandi will have another sonogram and we'll have a chance to visit more about financial aid and visit the Ronald McDonald House (where we will be living for our long-term stay in Philadelphia). We'll fly back to Kansas City late Monday evening and arrive early AM Tuesday morning. Update: We made it to Philadelphia safe and sound. Due to demand, we added the ability to follow the blog through email updates. Please see the info on the right-hand side of the website or click here to sign up. We appreciate everyone's support, prayers and interest in the site. Kind of like a garage sale online - items are being auctioned online to help raise funds. The items for sale can be located on Nex-Tech Classifieds: Click Here to view a list of items. There's a little bit of everything being added. Every little bit helps. We wanted to spread the word of an upcoming event that could help our family greatly. Friends of ours are hosting a yard sale / bake sale for the benefit of Jordan to help cover the tremendous expenses we are about to face. We are very excited about the sale and are hoping for a good turnout. If you have items you would like to donate or bake, please call 785-259-6773. What a weekend... Although not directly related to Jordan's Story, our nephew Pierce LaFond had his own experience that we wanted to share. At only 3 weeks old, baby Pierce began vomiting after each feeding. His mom and dad tried several different things including treating him for acid reflux with no success. On Friday, July 8th, my brother called me to let us know they had taken baby Pierce to a regional hospital in southwest Kansas. Pierce, now 6 weeks old, had lost a pound and weighed the same as the day he was born. He received an IV and was restricted to a diet of Pedialyte, which he still was not keeping down. My brother thought it was Pyloric Stenosis, but the sonogram wasn't detecting it. We recommended they move to a hospital that has seen this before. By that point, they were thinking the same thing. Saturday morning around 12:45 am, baby Pierce and his mom were loaded on an ambulance and transferred to Wesley Medical Center in Wichita. I met my brother in Greensburg, KS and we drove to Wichita together - arriving at 4:30am, Saturday morning. It was nice to have someone else there to keep each other awake. The tests at Wesley did show Pyloric Stenosis - a swelling of the pylorus valve around the entrance to the small intestine. This usually occurs around 3 to 6 weeks in newborns. If you are interested, you can read more about Pyloric Stenosis here. Pierce underwent surgery yesterday afternoon and the surgeon said it was a "cookie-cut case". They are gradually increasing his fluids and slowly mixing back in his mother's milk. I've never seen a baby that looked so hungry. All I could think is, "Boy, will he be glad to finally get a drink of milk." We are very thankful that our nephew is on the mend. While visiting CHOP the first time, our social worker mentioned we could play soft music for our son while he is in recovery. Some infants respond to the stimulation well while others require silence for the most part. We have read accounts of some parents who couldn't talk to their newborn because the extra stimulation would cause their vitals to fall. Others have had good success by playing music. 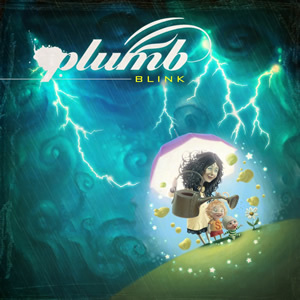 Several years ago, we bought Plumb's album Blink during our first pregnancy. Her lullabies now bring us more comfort than ever. Each song is filled with a mother's heart for her infant as they remind us how much God the Father loves children. The music is very creative and is enjoyable for both children and parents. We wanted to share the music we are planning to play at Jordan's bedside - for hope and encouragement. Brandi even relates to the album art. As a mother, she just wants to protect Jordan from the events to come. It reminds us to trust in God's protection for our family. Tiffany Lee (Plumb) on the Album Art ~ "An illustrator named Fernando Juarez from Spain created it. The cover art is such an amazing depiction of what the whole album means. First and foremost, the word 'safe' is relative. We may or may not know the evil or chaos going on around us, but ultimately, if we belong to the Father, we are safe."